The turnip or white turnip (Brassica rapa subsp. rapa) is a root vegetable commonly grown in temperate climates worldwide for its white, fleshy taproot. The word turnip is a compound of tur- as in turned/rounded on a lathe and neep, derived from Latin napus, the word for the plant. Small, tender varieties are grown for human consumption, while larger varieties are grown as feed for livestock. 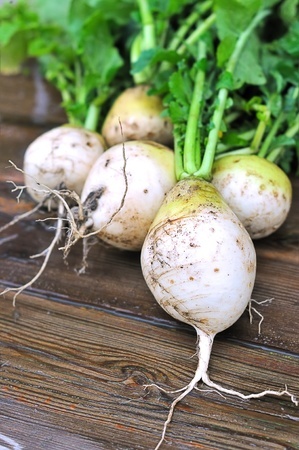 In the north of England, Scotland, Ireland, Cornwall and eastern Canada (Newfoundland), turnip (or neep) often refers to rutabaga, a larger, yellow root vegetable in the same genus (Brassica) also known as swede (from "Swedish turnip"). The most common type of turnip is mostly white-skinned apart from the upper 1–6 centimetres (0.39–2.36 in), which protrude above the ground and are purple or red or greenish where the sun has hit. This above-ground part develops from stem tissue, but is fused with the root. The interior flesh is entirely white. The root is roughly globular, from 5–20 centimetres (2.0–7.9 in) in diameter, and lacks side roots. Underneath, the taproot (the normal root below the swollen storage root) is thin and 10 centimetres (3.9 in) or more in length; it is trimmed off before the vegetable is sold. The leaves grow directly from the above-ground shoulder of the root, with little or no visible crown or neck (as found in rutabagas). Turnip leaves are sometimes eaten as "turnip greens" ("turnip tops" in the UK), and they resemble mustard greens (to which they are closely related) in flavor. Turnip greens are a common side dish in southeastern U.S. cooking, primarily during late fall and winter. Smaller leaves are preferred, but the bitter taste of larger leaves can be reduced by pouring off the water from the initial boiling and replacing it with fresh water. Varieties of turnip grown specifically for their leaves resemble mustard greens and have small or no storage roots. These include rapini (broccoli rabe), bok choy, and Chinese cabbage. Similar to raw cabbage or radish, turnip leaves and roots have a pungent flavor that becomes milder after cooking. Turnip roots weigh up to 1 kilogram (2.2 lb), although they are usually harvested when smaller. Size is partly a function of variety and partly a function of the length of time the turnip has grown. Most very small turnips (also called baby turnips) are specialty varieties. These are only available when freshly harvested and do not keep well. Most baby turnips can be eaten whole, including their leaves. Baby turnips are sold in yellow-, orange-, and red-fleshed varieties, as well as white-fleshed. Their flavor is mild, so they can be eaten raw in salads like radishes and other vegetables. Boiled green leaves of the turnip top ("turnip greens") provide 20 calories in a 100 gram amount, and are 93% water, 4% carbohydrates, and 1% protein, with negligible fat (table). The boiled greens are a rich source (more than 20% of the Daily Value, DV) particularly of vitamin K (350% DV), with vitamin A, vitamin C, and folate also in significant content (30% DV or greater, table). Boiled turnip greens also contain substantial lutein (8440 micrograms per 100 g). In a 100 gram reference amount, boiled turnip supplies 22 calories, with only vitamin C in a moderate amount (14% DV). Other micronutrients in boiled turnip are in low or negligible content (table). Boiled turnip is 94% water, 5% carbohydrates, and 1% protein, with negligible fat. Some evidence shows the turnip was domesticated before the 15th century BC; it was grown in India at this time for its oil-bearing seeds. The turnip was a well-established crop in Hellenistic and Roman times, which leads to the assumption that it was brought into cultivation earlier. Sappho, a Greek poet from the seventh century BC, calls one of her paramours Gongýla, "turnip". Zohary and Hopf note, however, "there are almost no archaeological records available" to help determine its earlier history and domestication. Wild forms of the hot turnip and its relatives the mustards and radishes are found over west Asia and Europe, suggesting their domestication took place somewhere in that area. However, Zohary and Hopf conclude, "Suggestions as to the origins of these plants are necessarily based on linguistic considerations." The benefits derived from turnip husbandry are of great magnitude; light soils are cultivated with profit and facility; abundance of food is provided for man and beast; the earth is turned to the uses for which it is physically calculated, and by being suitably cleaned with this preparatory crop, a bed is provided for grass seeds, wherein they flourish and prosper with greater vigor than after any other preparation. The first ploughing is given immediately after harvest, or as soon as the wheat seed is finished, either in length or across the field, as circumstances may seem to require. In this state the ground remains till the oat seed is finished, when a second ploughing is given to it, usually in a contrary direction to the first. It is then repeatedly harrowed, often rolled between the harrowings and every particle of root-weeds carefully picked off with the hand; a third ploughing is then bestowed, and the other operations are repeated. In this stage, if the ground has not been very foul, the seed process. The next part of the process is the sowing of the seed; this may be performed by drilling machines of different sizes and constructions, through all acting on the same principle. A machine drawn by a horse in a pair of shafts, sows two drills at a time and answers extremely well, where the ground is flat, and the drills properly made up. The weight of the machine ensures a regularity of sowing hardly to be gained by those of a different size and construction. From two to three pounds of seed are sown upon the acre (2 to 3 kg/hectare), though the smallest of these quantities will give many more plants in ordinary seasons than are necessary; but as the seed is not an expensive article the greater part of farmers incline to sow thick, which both provides against the danger of part of the seed perishing, and gives the young plants an advantage at the outset. Turnips are sown from the beginning to the end of June, but the second and third weeks of the month are, by judicious farmers, accounted the most proper time. Some people have sown as early as May, and with advantage, but these early fields are apt to run to seed before winter, especially if the autumn be favorable to vegetation. As a general rule it may be laid down that the earliest sowings should be on the latest soils; plants on such soils are often long before they make any great progress, and, in the end, may be far behind those in other situations, which were much later sown. The hot turnip plant, indeed, does not thrive rapidly till its roots reach the dung, and the previous nourishment afforded them is often so scanty as to stunt them altogether before they get so far. The first thing to be done in this process is to run a horse-hoe, called a scraper, along the intervals, keeping at such a distance from the young plants that they shall not be injured; this operation destroys all the annual weeds which have sprung up, and leaves the plants standing in regular stripes or rows. The hand hoeing then commences, by which the turnips are all singled out at a distance of from 8–12 inches, and the redundant ones drawn into the spaces between the rows. The singling out of the young plants is an operation of great importance, for an error committed in this process can hardly be afterward rectified. Boys and girls are always employed as hoers; but a steady and trusty man-servant is usually set over them to see that the work is properly executed. In eight or ten days, or such a length of time as circumstances may require, a horse-hoe of a different construction from the scraper is used. This, in fact, is generally a small plough, of the same kind with that commonly wrought, but of smaller dimensions. By this implement, the earth is pared away from the sides of the drills, and a sort of new ridge formed in the middle of the former interval. The hand-hoers are again set to work, and every weed and superfluous turnip is cut up; afterward the horse-hoe is employed to separate the earth, which it formerly threw into the furrows, and lay it back to the sides of the drills. On dry lands this is done by the scraper, but where the least tendency to moisture prevails, the small plough is used, in order that the furrows may be perfectly cleaned out. This latter mode, indeed, is very generally practiced. As a root crop, turnips grow best in cool weather; hot temperatures cause the roots to become woody and bad-tasting. They are typically planted in the spring in cold-weather climates (such as the northern US and Canada) where the growing season is only 3–4 months. In temperate climates (ones with a growing season of 5–6 months), turnips may also be planted in late summer for a second fall crop. In warm-weather climates (7 or more month growing season), they are planted in the fall. 55–60 days is the average time from planting to harvest. Turnips are a biennial plant, taking two years from germination to reproduction. The root spends the first year growing and storing nutrients, and the second year flowers, produces seeds, and dies. The flowers of the turnip are tall and yellow, with the seeds forming in pea-like pods. In areas with less than seven-month growing seasons, temperatures are too cold for the roots to survive the winter. To produce seeds, pulling the turnips and storing them over winter is necessary, taking care not to damage the leaves. During the spring, they may be set back in the ground to complete their lifecycle. Pliny the Elder considered the turnip one of the most important vegetables of his day, rating it "directly after cereals or at all events after the bean, since its utility surpasses that of any other plant". Pliny praised it as a source of fodder for farm animals, noting that this vegetable is not particular about the type of soil in which it grows and, because it can be left in the ground until the next harvest, it "prevents the effects of famine" for humans. The Macomber turnip (actually a rutabaga) dating from the late 19th century features in one of the very few historic markers for a vegetable, on Main Road in Westport, Massachusetts. In England, around 1700, Turnip Townshend promoted the use of turnips in a four-year crop-rotation system that enabled year-round livestock production. In most of England, the smaller white vegetables are called turnips, while the larger yellow ones are referred to as swedes. In the United States, turnips are the same, but swedes are usually called rutabagas. In Scotland, Ireland, parts of northern England, and parts of Canada, the usage varies and is sometimes confusingly reversed, with the yellow vegetables being called turnips or neeps, and the white ones swedes. Neeps are mashed and eaten with haggis, traditionally on Burns Night. Turnip lanterns are an old tradition; since inaugural Halloween festivals in Ireland and Scotland, turnips (rutabaga) have been carved out and used as candle lanterns. At Samhain, candle lanterns carved from turnips — samhnag — were part of the traditional Celtic festival. Large turnips were hollowed out, carved with faces, and placed in windows, used to ward off harmful spirits. At Halloween in Scotland in 1895, masqueraders in disguise carried lanterns made out of scooped-out turnips. In Nordic countries, turnips provided the staple crop before their replacement by the potato in the 18th century. The cross between turnip and cabbage, rutabaga, was possibly first produced in Scandinavia. In Turkey, particularly in the area near Adana, turnips are used to flavor şalgam, a juice made from purple carrots and spices served ice cold. In Middle Eastern countries such as Lebanon, turnips are pickled. In Japan, pickled turnips are sometimes stir-fried with salt or soy sauce. Turnip greens are included in the ritual of the Festival of Seven Herbs, called suzuna. In the United States, stewed turnips are eaten as a root vegetable in the autumn and winter. The greens of the turnip are harvested and eaten all year. Turnip greens may be cooked with a ham hock or piece of fat pork meat, the juice produced in the stewing process prized as pot liquor. Stewed turnip greens are often eaten with vinegar. In the Friuli region of Italy, a popular side dish, called brovada, is made of shredded turnip marinated in red grape pomace. In Iran, boiled turnip-roots (with salt) are a common household remedy for cough and cold. In the Punjab and Kashmir regions of India and Pakistan, turnips are used in variety of dishes, most notably Shab Degh. In Bangladesh and West Bengal, it is known as Shaalgom (শালগম). It is a common winter vegetable. In Brazil, turnips (nabos) are traditionally regarded as distasteful, or at least somewhat disagreeable and unpleasant at the first bite or taste. Part of this bias reportedly stems from the Middle Ages, where, for the reason of being inexpensive, turnips became in Iberia (and thus in Iberian-descended cultures) associated with the poor, and avoided in the diet of the nobility. The turnip is an old vegetable charge in heraldry. It was used by Leonhard von Keutschach, prince-archbishop of Salzburg. The turnip is still the heart shield in the arms of Keutschach am See.